We have very exciting news. 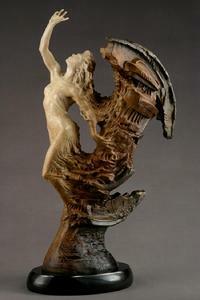 Martin Eichinger's classic sculpture Gaia's Breath is being reimagined in a new four feet tall edition. 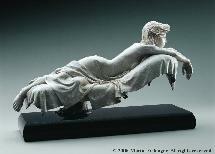 This sculpture has been one of the most well received sculptures that have ever come out of the Eichinger Sculpture Studio. Since 1995 when the original was crafted there have been several editions at different scales but the demand for it has remained continuous and all previous editions have sold out. 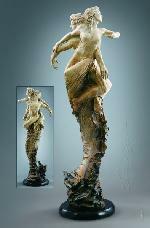 In response to this demand Martin Eichinger has decided to offer a limited edition of fifty at this never before seen scale. 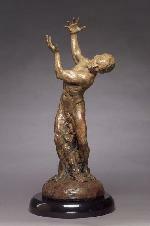 Martin's sculpture seems alive and in full motion which is an extremely hard thing to do in bronze. 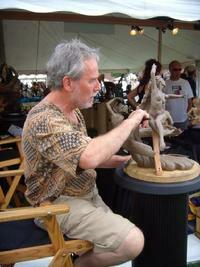 Every aspect of producing a sculpture is truly an art with Martin. There is never any question that every detail will be perfect. 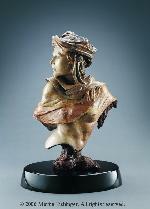 Not only are the proportions right on, facial features exquisitely detailed, patinas expertly orchestrated, he even starts with a state of mind weeks or months before the piece is sculpted. He aspires to celebrate the best of mankind, the hope for tomorrow, the love of today. I find him a very gentle soul and a wonderfully interesting person to know." "It is my goal to produce artwork that comes from a place deep inside of me and I have used meditation techniques to quiet the chatter and help make clear what remains. My work exposes emotions or reactions to what I observe and hopefully a bit of wisdom. 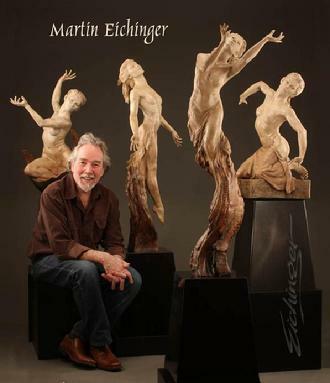 Each series is a study down a path of personal meditation, but with this new series, that path loops back around and looks at the meditation process that I have followed for the past 30 years," says artist Martin Eichinger, who recently completed his Meditation Series of four sculptures. "Using a simple meditation of counting my breaths, 1 thru 4, each breath first manifests as a thought and eventually becoming a vision. “One With The Universe” reminds me that I am part of something bigger than me. “To Love Is To Be” is about the essential nature of loving and being loved. “Three Options Are Open” rejects polarized or black and white thinking and helps me see new possibilities. “Fortify My Spirit” is an acknowledgement that my request for strength has been answered. Together they create a mythic grounding or a collective narrative for my being. I became an artist to participate in a renaissance dialog about our lives, our civilization and the essential elements that give meaning to life. I hope the Meditation Series can add to this conversation." "Making art that somehow touches people in an intimate way is a remarkable role to try to live out in one's life. Most of the time my efforts just serve to keep me humble. And when I do sometimes succeed, I feel like I was "given" something important, not like I "made" something important. 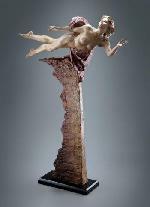 "Martin Eichinger continues to narrate statements of turmoil and pleasure. 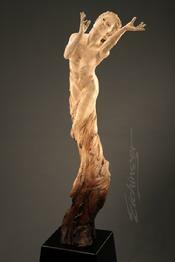 The Portland based sculptor continues his search for a new sense of meaning in art and in life by featuring collective works from The Dream Series, The Duet Series, The Goddesses Series, The Exotic Women Series and The Meditation Series. 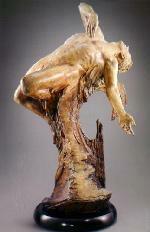 "Seeing in the Dark" 29"
"Martin Eichinger deploys his virtuosic, intuitive command of human anatomy in the service of timeless narratives. 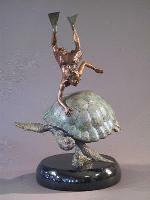 In the lineage of Donatello and the great sculptural dramatists of the Renaissance, he tells stories in bronze, which resonate with emotional and symbolic impact in our contemporary times. 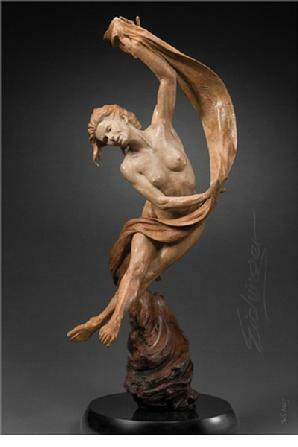 Eichinger is that rare figurative sculptor who transcends "realism" in pursuit of a more evocative "romanticism," depicting men and women as mythic archetypes who embody exalted states of human potential. These invigorating vignettes of aspiration, achievement, love, and beauty are the stuff of which dreams-and more importantly, lives-are made." Working in his 6,000-square-foot studio, with its 16-foot-high-ceilings and specialized enlarging equipment, Eichinger creates dramatic bronzes that range in scale from intimate to monumental. For more than twenty years, this dynamic, visionary artist has produced limited-edition sculptures that engage the minds and hearts of collectors and resonate within our larger social and political culture. 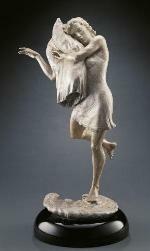 Grouped into themed series-Dream, Circus, Exotic Women, Goddess, Duet, Passage, Dance, and Mythic Man-the sculptures chronicle the eternal human pursuit of meaning, happiness, and growth. In addition to his University degrees, Eichinger undertook independent studies in classical sculpture throughout Europe. 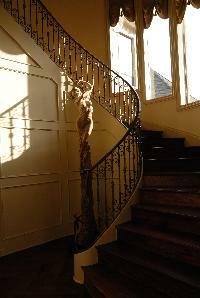 Today, as a master teacher, he is founder and faculty member of the Fire & Earth Art Center (www.fireandearth.org), a Portland, Oregon art school that stresses the imperative for meaning and emotional content in addition to formal aesthetic technique. Over the past two decades Eichinger has taught numerous workshops and mentored more than twenty apprentices. A professional member of the National Sculpture Society, he is also a founding member of the Pacific Northwest Sculpture Association. His work is represented by more than two-dozen fine art galleries throughout the United States and is housed in over 1,000 private and corporate collections around the world. 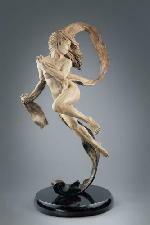 Sign in to be placed on a Martin Eichinger alert list for new work. 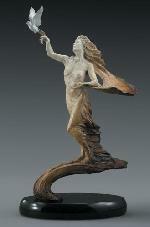 We are pleased to introduce an original fountain by romantic, narrative sculptor Martin Eichinger. 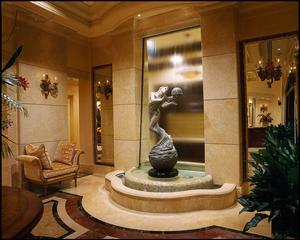 Symphony in S Minor features eight figures in cast bronze, gently rotating above falling water. The symbols and characters are separate yet connected, much like the instruments that make up a Symphony. 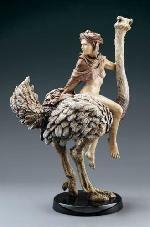 S Minor refers to the minor form of three-dimensional sculpture, bas-relief. 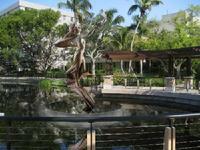 Released as a limited edition of 15, the bronze measures 40 inches in diameter, and total height of fountain is 74 inches. 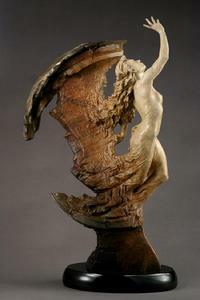 Please contact the gallery for more information on this innovative fountain by Martin Eichinger.